Available for $595 + $120 per year, Create Company will create a Sage 300 company database in a SQL Server environment without the necessity of using a database management console or the Sage 300 database setup utility. 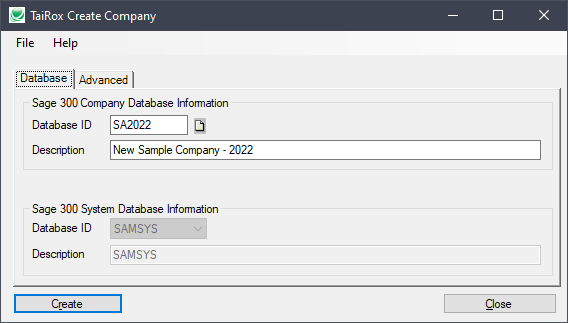 When used with Copy Company, Create Company allows a finance department to set up small test databases without involving IT staff or contractors. Important Notes: Some initial coordination with IT staff or contractors may be required, initially, to provide access passwords and rights. It may be necessary to adjust backup processes when new production databases are created. • This product uses Accpac business objects to insure that a valid database is being created.